The modern Vesuvius has not the appearance that it presented two thousand years ago. When Caesar looked upon it from Baiae, or Virgil from Posilipo, or when St. Paul beheld it, nineteen years before it overwhelmed Pompeii, it was not the gigantic lighthouse that it is to-day. It was a beautiful mountain then, clothed to the top with fertile fields and vineyards. Even its summit was a grassy plain, nine miles in circuit, and there the gladiator Spartacus and his companions kept for a time at bay an army sent out from Imperial Rome. 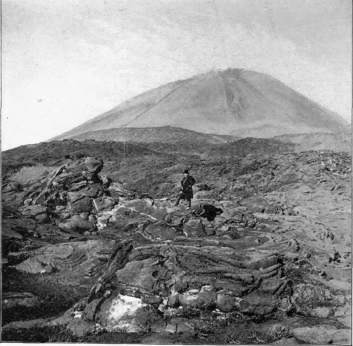 Vesuvius, as it now appears, reveals a scene of frightful desolation. Over its sides has rolled repeatedly a perfect deluge of destruction, withering, burning, suffocating everything: first, with its scorching breath; then, with its thick, resistless tide of red-hot lava. This lava is now cold and petrified, resembling in some respects an Alpine glacier; only, instead of glittering ice, these billows are of inky blackness. It is, moreover, of enormous thickness. Unnumbered layers of it have been spread out here, until the mountain is a kind of palimpsest, on which the demon of destruction has, more than a score of times within the present century, written the records of its devastation in characters of fire. 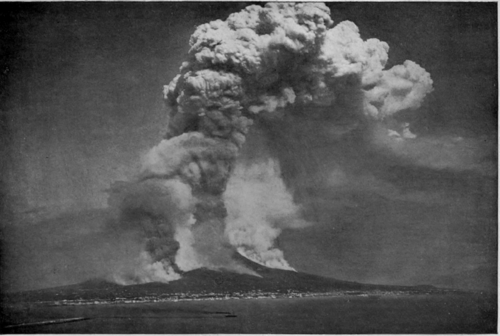 The eruption of 1872 was one of the most tremendous since the destruction of Pompeii. Filled to the brim with molten lava, the mountain's fiery bowl was then shattered by a fierce convulsion, and poured forth twenty million cubic yards of liquid fire over a country filled with flowers and blossoms. One of the lava streams was three thousand feet wide, twenty feet deep, and had a temperature of two thousand degrees, Fahrenheit! 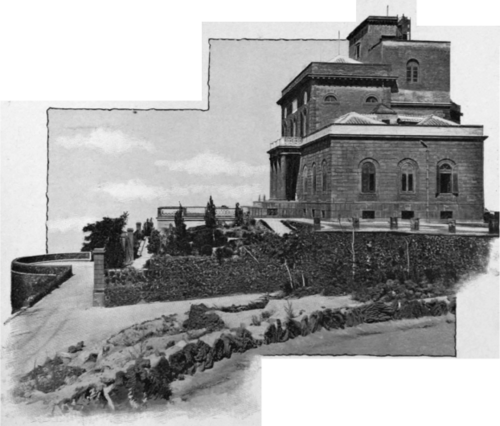 In the observatory of Vesuvius, situated on a spur of the mountain, scientific men are stationed to observe a delicate instrument which indicates by the vibrations of a needle the degree of the volcano's activity. It is, however, a position of great danger. In 1872 an awful wave of lava came rolling toward this ledge as if to overwhelm it. Happily, it divided at the base of the cliff and went on either side; but, when the divisions met again at its lower extremity the director,I saw and talked with Palmieri, and it was thrilling to hear him describe the heat which then for days was so intense as well-nigh to destroy them, the red-hot stones which fell around them from a fearful height, and the extraordinary grandeur of the flood of fire. "Would you remain through another such eruption?" I asked him. "Certainly," he replied, "my life belongs to science. If the observatory falls, I wish to fall with it". Advancing beyond this point to the base of the cone, I found that an amazing change had taken place here since my previous visits. Where I had formerly climbed fifteen hundred feet through lava ashes ankle-deep, an open car, on a wire-rope railway, now transports the tourist almost to the crater. This method of conveyance looks extremely perilous; but, in reality, beneath the shifting ashes is a bed of lava, as hard as granite; and unless torn to pieces by some great eruption, I see no reason why this railroad, resting upon such a foundation, should not last indefinitely. While being drawn up the steep volcanic cone by steam power, as easily as up the Rigi, I thoroughly appreciated the difference between this mode of travel and the terribly fatiguing climb of former times. As the cone has an inclination of from forty-five to sixty-three degrees, it is almost impossible to gain a genuine foothold. In the old way of making the ascent I would slip back at every step almost as far as I advanced, and every few minutes had to halt for breath. I find, in looking over my old note-books, both times that I climbed the cone I was an hour in reaching the summit; but that, on the other hand, I came down again in four and a half minutes, descending at a break-neck speed, when once started in the slippery, sliding ashes. 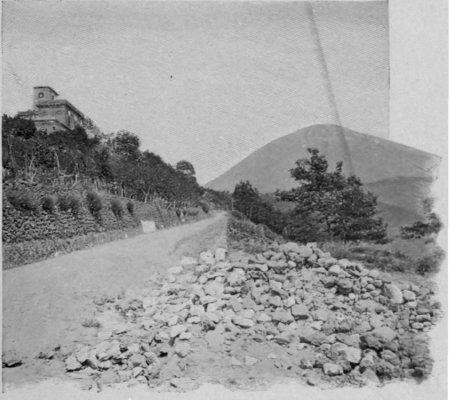 Even by the new mode of ascending Vesuvius, when we arrived at the upper terminus of the cable road, we found that we could still enjoy a little sample of the old style of mountain climbing; for, of course, the railroad does not go actually to the crater. That would be foolhardy, since this fiery workshop of Vulcan is by no means tranquil. About two hundred and fifty feet of the mountain, therefore, must be vanquished in the ancient fashion. A score of guides rushed forward to assist us, and offered for our aid and comfort a most embarrassing variety of canes, straps, and chairs, in addition to their own shoulders. We did not hesitate. The sun was hot, the ashes uninviting. Moreover, as Napoleon once said in reference to dancing, "forty years are forty years." I therefore took a chair which three unhappy men solemnly swore they would not drop, while my comrade got astride the shoulders of a stalwart guide. Thus mounted we exclaimed, "Excelsior!"